How a Glass Canopy Can improve the look of your building? A glass canopy will enhance the appearance of your building, whether it’s your home or your workplace. It really doesn’t matter how old your building is. Whether you have a 21st Century office block or a house that was built some time ago, a canopy made from glass will blend in with the building’s existing style and will enhance its natural features no end. Glass has the ability to do this as it’s a timeless material and is always in vogue. 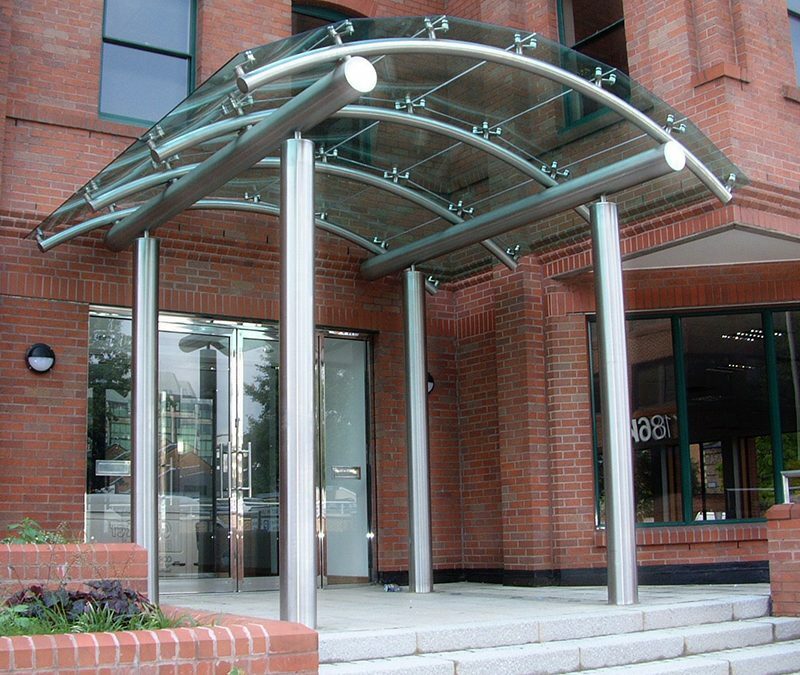 Having a glass canopy is an ideal way to give your building’s entrance the wow factor. Glass is both stylish and functional and overhead glazing can replace old-fashioned fabric sun canopies, awnings or even wooden porches, which can fade, degrade and become tatty over time. These also tend to make an entrance look dark, whereas glass has the opposite effect. People will feel more welcome as soon as the clap eyes on your entrance and stepping across the threshold into your building will always be a real pleasure. Glass allows natural light to enter from the front and gives a modern look to your home or office. Even so, you still get all the benefits of being protected from strong sunlight and harsh elements, which is exactly what’s required from a canopy! Adding a canopy made from glass to your entrance instantly creates a stunningly modern place for people to enter, gather and linger. A larger canopy may even encourage people to spend time underneath it, perhaps standing or sitting and relaxing, basking in the natural light and admiring the view without needing to worry about the weather. This means your home of work building instantly gives the impression of being a place where people will enjoy spending time. Clear glass is often a popular choice for canopies but you don’t have to stick to the conventional look. You could choose a canopy in many different colours and types of glass. A brightly-coloured canopy from glass could really add a striking visual appearance and unique touch to your entrance. Glass offers a flexibility and diversity that you don’t get from many other materials, e.g. wood, fabric or UPVC. Glass canopies also come in many different styles. You could choose a gable or arched canopy or possibly an extendable or XL canopy, to name but a few of the choices available. When you combine this level of choice with the different glass finishes you can get, it’s plain to see just how unique a canopy in glass can be. Perhaps you’d like clear glass or even an opaque canopy? Maybe you really want to push the boat out and choose bevelled or stained glass? The options are almost as limitless as your imagination! Glass canopies are lightweight and they also look light, bright and airy, even though underneath you have a structure that’s extremely durable and robust. When you choose a quality canopy made from glass, you’re buying a strong and practical product. Canopies made from thick and toughened glass will withstand the elements for many years. Hard frosts, heavy snow falls and the strong light of the sun are all no problem for quality glass. Glass doesn’t fade, change colour, rust or tarnish over time like many materials do. It’s also very easy to keep clean. Every time you clean the glass on your canopy it will sparkle and look just as good as it did when it was new. The many aesthetic benefits from canopies made from glass are driving their recent surge in popularity. From budget to luxury options, there are glass canopies to match every building entrance, turning these from drab to dapper in no time at all.